Every bride and groom hopes for an unforgettable wedding reception. And while there are many ways to pull that off–good food, great music, and a breathtaking setup–one of my favorite things to do at a wedding reception is to play games. It’s a great way to keep your guests entertained, share more cute tidbits about the bride and groom, and keep the conversation going among guests! If you have no idea where to start, don’t worry, we’ve got you covered! We came up with these fun games (with matching templates!) that you’ll definitely want to play during your wedding reception. Have the bride and groom play for themselves in front of everyone to show just how much they know about each other! Mechanics: Guests will sign the spaces that they match, like “Picked the vegetarian option on the menu” or “Knew the groom in college”! Give these cards out before your reception, and while your guests wait for the program to begin, they have to mingle to find other guests to fill out the spaces. Have the program host read out the cards of the winners for a fun program segment too! 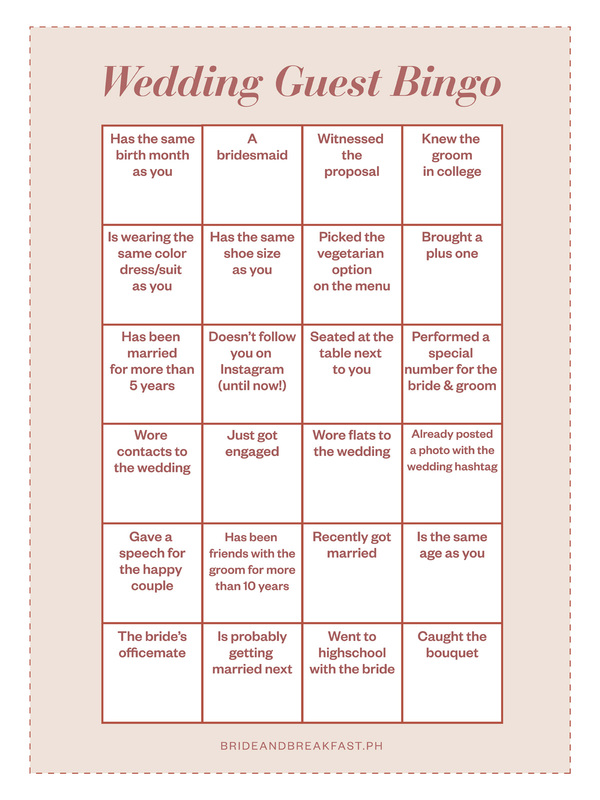 Mechanics: Add up the points for every single thing you’ve done at a wedding. Hand out these cards to your guests before the reception and find out who has the highest score during a segment in your wedding reception! Mechanics: Use your phone or camera to take photos of these special and memorable moments! Distribute these to all your guests upon registration or as part of the table setting. You can look back at all these photos as you browse through social media after your wedding! Mechanics: Each table will be provided placards that say “BRIDE” and “GROOM”. Play the game as a team by table. The host will read out this list of questions and raise your answers to make your guess! It’s a fun way for friends and family to get to know the bride and groom as a couple and how they are with each other! Mechanics: Your host will pick a command from the bowl, read it out loud, and the couple can choose any one of their guests to act out or perform the command! Cut these out, put them in a bowl, and hand them to the host! It’s an entertaining game that can be done during one segment in your reception or periodically throughout the night. « Find Your Dream Venue, Gorgeous Reception Details, and One-of-a-Kind Wedding Details This Month!